Until recently, two men with the same name were derailing my research. The name Peter Meid (Mead) was a problem. I was unable to discern which immigration record went with the correct Peter Meid. Once I discovered my third great-grandfather Peter Meid‘s naturalization papers, it settled the issue. But I still wondered if these two men from Hesse, Germany were related. In fact, they are related and one Civil War newspaper article tells a great tale of my third great-grandfather Peter Meid’s cousins: Christian Meid of Franklin, Indiana and his brother Peter of New Orleans, Louisiana. Christian and Peter Meid were born at Hähnlein, Hesse-Darmstadt (now Germany) in 1833 and 1835, respectively to Christian Meid and Catherina Rückert. I don’t know much about the family other than its location and that Alsbach Castle overlooks the town. Like millions of Palatine Germans, some Meids from Hesse immigrated to America. In 1854, their cousins Peter Meid (my ancestor) and Philip Meid, a harness maker, left for New York. Others like my third great-grandma Carrie left Rhineland in 1857. As part of that trend, Christian and Peter arrived at New York on 4 December 1857. They sailed from Le Havre, France on board the ship Annawan. In 1859, the two Meid boys went to New Orleans, intending to head north to Cincinnati. City life in New Orleans was foreign to Christian and Peter and a farmer’s life seemed more palatable for these young men from a small German town. On the day they would travel to Cincinnati, the two accidentally took different boats. Christian went all the way to Cincinnati. Peter, believing that his brother would disembark at the first port realizing they were not together, got off at Natchez, then returned to New Orleans. Christian would wait weeks in Cincinnati before giving up on Peter’s arrival, moving to Franklin, Indiana. Peter permanently settled in New Orleans after failing to find his brother and married that December. When the Civil War broke out, both Christian and Peter enlisted. Christian served as a private in the 3rd Indiana Cavalry (3rd Indiana Cav. was eventually split, and although his Company F was ordered to join the Army of the Potomac, Christian served in the Army of the Ohio, at least in 1863.). Peter Meid was a member of the Lafayette Volunteers, Fire Battalion, Co. A in Louisiana Militia (this battalion was ultimately dissolved and the soldiers were distributed among regiments in need). By 1863, the war had dragged on far longer than those in Washington had anticipated. By Independence Day 1863 however, two major victories turned the tide of war. Union triumphs at Gettysburg and Vicksburg would be the turning point but the South wasn’t finished. 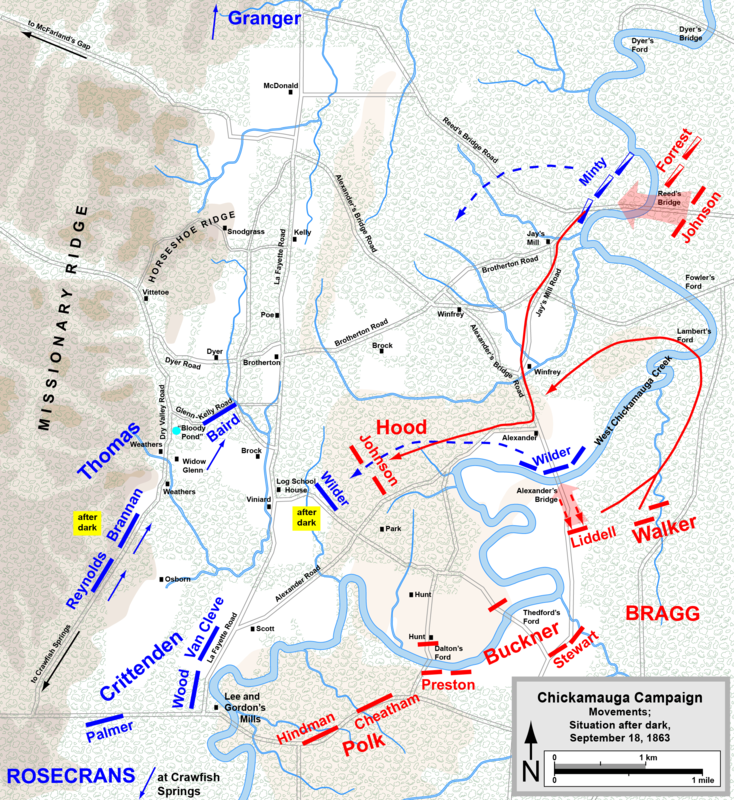 In September 1863, Union and Confederate forces clashed in the Battle of Chickamauga. Just south of Chattanooga, Tennessee, this battle is known as the Civil War’s second bloodiest battle. According to the newspaper account, Christian and Peter were not only at the battle, they were in regiments that faced each other! If the account is true to its word, Christian would’ve fought during the opening phase, when Union cavalry prevented Rebel forces from crossing Reed’s Bridge (see map). The brigade fought valiantly, buying time for Union troops to settle into positions behind them. Both men survived the war and returned home. Christian was a farmer and Peter, a shoemaker. Years later, Peter would make several donations to a missionary society. Christian received a pamphlet from the same organization and saw Peter Meid of New Orleans on the donation list. Christian inquired by writing to Peter and discovered that the same was his brother whom he hadn’t seen in thirty-seven years. I hope their 1896 reunion was a sweet one. ← Telling the Story… Research Can Get in the Way.